On January 5, 2011, in his first official act, incoming Governor Mark Dayton signed executive orders implementing Medicaid expansion in Minnesota to cover childless adults with incomes at or below 75 percent FPL, beginning on March 1, 2011.67 Among the adults newly qualifying for Medicaid coverage, many were already served by the state-funded GAMC program. Although that program already had 75 percent FPL as an upper eligibility limit, it had been severely cut back under the previous Governor and served only a small percentage of income-eligible consumers. Even fewer were covered by MinnesotaCare, a longstanding state program that offered more mainstream insurance (with limited hospital coverage) to childless adults up to 175 percent FPL. State officials believed that replacing these state-funded programs with federally-matched Medicaid would improve indigent residents’ access to care, cut financial losses experienced by Minnesota hospitals, and provide fiscal relief to the state budget. To provide Medicaid both to these consumers and the uninsured who would become newly eligible, the state used two major strategies. The first involved coordination with Minnesota Hospital Association (MHA), which represents all but three hospitals in the state. DHS established a toll-free telephone line dedicated to hospital emergency rooms. ER staff could use this number to begin applications on behalf of uninsured patients. DHS would complete the application, enroll patients into coverage, and ensure that the hospital received reimbursement. Both MHA and DHS communicated with hospitals via newsletters, email messages, and other channels. According to MHA officials, some hospitals were at first skeptical but rapidly became convinced of the reliability and value of this telephone resource. If DHS staff were not immediately available, hospitals could leave a message and would soon receive a return call. DHS staff provided knowledgeable, accessible assistance that eliminated the need for hospitals to refer patients to local social services offices for hospital staff to become Medicaid eligibility experts. This telephonic connection helped when new patients who were uninsured sought emergency care. It also proved useful with uninsured or GAMC-covered patients who were well-known to hospitals. Before the March 1 start date of new Medicaid eligibility, many hospitals connected these “regulars” with DHS staff and enrolled them into Medicaid so that they were pre-qualified when new coverage began. 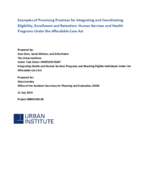 A second strategy provided Medicaid to consumers known to DHS based on their receipt of coverage through Minnesota’s previous state-funded health programs. This group included approximately 17,000-20,000 people GAMC recipients, approximately 35,000 people who had previously received GAMC coverage but left the program since changes made during the previous Administration, and a number of MinnesotaCare recipients with incomes at or below 75 percent FPL. Officials recognized that the laborious and complex task of updating the Medicaid program’s 30-year-old computer system required a long time to accomplish. Rather than delay all the gains of expansion until the necessary IT investment was complete, DHS enrolled these consumers into Medicaid manually. The workload was divided between state and county eligibility staff, and many with other duties were reassigned to Medicaid enrollment. Case workers read information from the GAMC and MinnesotaCare case files and manually entered this into the Medicaid eligibility system, as if each individual were newly applying and qualifying for Medicaid. As with hospital-based enrollment of frequent ER visitors, this second strategy enrolled numerous eligible consumers before expanded eligibility began on March 1. DHS also used more traditional outreach and enrollment strategies, including funding community-based organizations to provide public education and application assistance. The state streamlined application procedures for the new category of Medicaid coverage to eliminate questions about assets and income verification requirements officials viewed as redundant. The state’s rapid success involved trade-offs. Because officials decided to enroll as many people as possible, as quickly as possible, state and county staff did a tremendous amount of work manually over a short period of time. This imposed administrative costs. Although staff expressed great enthusiasm for undertaking the work, some exhaustion and “burn-out” resulted. Officials understood that they could have avoided these costs by delaying the start of enrollment until IT systems were ready. That would have impeded access to care for consumers and adequate reimbursement for hospitals for at least an additional six months. Or they could have asked consumers, rather than state staff, to complete the necessary paperwork to transition from GAMC or MinnesotaCare to Medicaid. The foreseeable result would have been that many would have failed to make the transition. Instead, DHS and counties chose to shoulder the burden themselves. Consumers and hospitals benefited greatly, but it came at a cost.